You can only use this effect of “Ash Blossom & Joyous Spring” once per turn. Ash Blossom & Joyous Spring is our Throwback Thursday, and is one of the best cards in the game from the time it debuted. Hand trap that stops any search from the deck or Special Summon from the deck, it became the best hand trap you could run and the best of the “Ghost Girl” archetype. Being a Level 3 Tuner is nice, but you won’t be using her to Synchro Summon, you will be using her to stop your opponent. She can’t be tossed down straight-away though, as many decks can merely press on through her, and once you play her you are locked out from playing another copy this turn. You need to pick the best moment to activate her, the best spot to halt your opponent. In that sense, Ash Blossom is a skill card much like how Ghost Ogre is as well. This little one found even more usefulness in the Salamangreat archetype, being a FIRE and a Level 3, her ability to be recycled back into the hand gives Salamangreat players more control options than searching/drawing Ash Blossom. Main Deck at 3, Side Deck at 3 if you can’t Main Deck, period. Ash Blossom & Joyous Spring deserves re-mentioning these days since it can be retrieved and reused in Salamangreat decks. Otherwise nothing has changed. She stops any deck from an awesome effect once per turn. Her only negative is reducing your hand size. Her effect can also be revoked by Called by the Grave now. Not to restate my previous reviews, but I am still curious as to what Synchro Monster these Tuners are supposed to summon. We’ll probably find out after the last two are revealed and released. Throwback Thursday Revisits Ash Blossom & Joyous Spring, and the Rebirth of Fire. For Throwback Thursday this week, I opted to go with the best FIRE monster outside the Salamangreat archetype that is good in the current meta, but better in Salamangreat since it is FIRE, and that card was the best card of 2017, Ash Blossom & Joyous Spring. Ash Blossom is a Level 3 FIRE Zombie Tuner with 0 ATK and 1800 DEF. ATK is low but it has great DEF on a Level 3, which said level is great for Tuners, it being FIRE might now be the best quality about it now beyond its effect since Sunlight Wolf can retrieve it, and it being a Zombie gives it all the Zombie support as well. 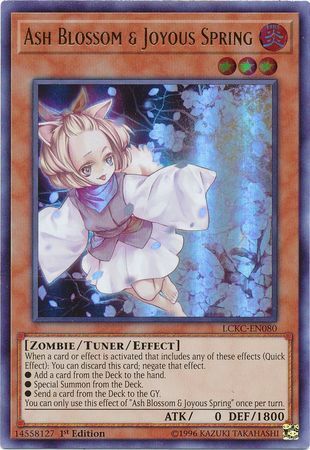 When a card or effect is activated that would add a card from the deck to the hand, Special Summon a monster from the deck, or send a card from the deck to the graveyard then you can discard this card from your hand to negate that effect. Some of the best cards in the game mess around with the deck, and while this can’t negate all of them, especially with newer cards being designed around this card it seems, it is still the best hand trap in the game arguably. Negating a search, summon, or deck thinning attempt is great because those are ways to get massive plays going for many decks. I can’t think of many decks that don’t have any cards that don’t do any of those three mentioned things, especially searching. Every good deck should have a searcher. This can also stop generic cards like Pot of Desires, Pot of Extravagance, Card of Demise, etc. It not negating the activation and just the effect can help as well in a few scenarios, Cyber Emergency is a good example, and it doesn’t hurt that the activation isn’t being negated considering it hurts cards with a hard once per turn on them. Ash Blossom is a hard once per turn as it should be, because negating all the searching gets a little out of hand. If you are fitting hand traps into your deck, Ash Blossom should likely be on the top of your list for considerations, especially in Salamangreat now since as I mentioned, Sunlight Wolf’s effect retrieves this for reuse, which makes it that much better. It most certainly deserved being called the best card of 2017. Art: 4.5/5 The Ghost Girls are excellent with their artwork. Even earning #1 card of 2017 honors, and is Semi-Limited in the OCG, and Unlimited in the TCG at present. About all Decks do all of these, and that means Ash Blossom and Joyous Spring is useful in about any and all situations. She’s a fine defender too, at 1800 defense, and being a Zombie benefits that theme, as well as being a Level 3 Tuner, if needed for Synchro Summoning. Being able to negate even just the one play (and remember, this can be used at 3) or multiple can just shut things down. Keeping your opponent from wailing on you or gaining advantage even just at a turn, while you CAN and do so to them, this card is phenomenal. Art: 5/5 Not sure how that’s a Zombie, she’s pretty and bright enough to be a Fairy. The space backdrop (I assume space perhaps, being so dark) in contrast with the colors of herself and the flowers are magnificent.